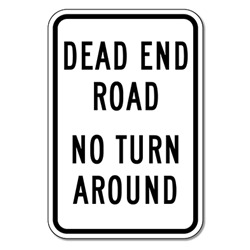 DOUBLE the working life of your Dead End Road No Turn Around Signs by adding 3M Protective Overlay Film (POF)! 3M’s high-tech POF protects sign faces against fading caused by the sun and harsh weather—and makes graffiti and sticker defacement damage easy to clear away without harsh abrasives. "I received my signs and just love them. So much, I just ordered some more. I will tell my friends about stopsignsandmore. Thanks!"